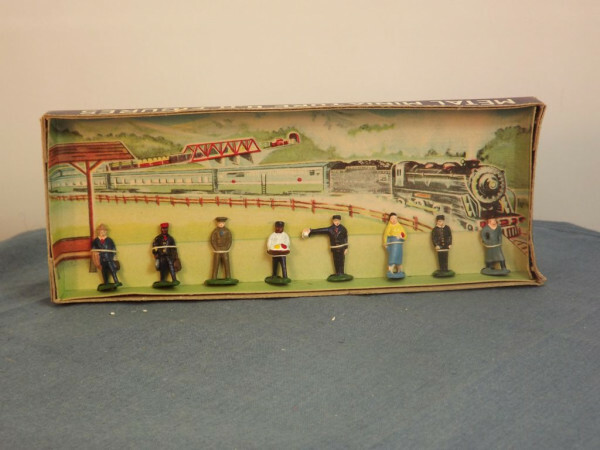 This model is the AHI 5859-1 Railway Station Personnel & Passengers Set in various colours. AHI is recorded as having copied several of the Kemlow/Wardie Master Models sets, originally released by Kemlow/Wardie in the 1950s, in the 1960s and exported them from Japan to the UK, USA, Canada, and Australasia. The set has 8 figures on foot. Four are clearly passengers, the remaining four railway personnel. They are molded in one piece that includes the figures and base stand. The first figure (Caucasian) is dressed in tan hat, a tan overcoat slung over his arm, blue suit, white shirt, red tie, he carries a dark brown briefcase, and his shoes have been painted green, the same as the base stand colour. The second figure (Afro-American or Indian?) is dressed in red hat, dark blue suit/uniform, blue shirt, and red tie. He carries a dark brown briefcase in his left hand, a light blue case in his right hand, has a silver package under his right arm, and his shoes have been painted green, the same as the base stand colour. The third figure (Caucasian) is dressed in a military uniform with khaki hat, khaki trousers, khaki shirt, and blue tie. He stand with his hands in his pockets and his shoes have been painted green, the same as the base stand colour. The fourth figure (Afro-American or Indian?) is dressed in black cap, white jacket, black trousers, and white shirt. He carries a dark brown tray with white straps. It is not clear what is on the tray — possibly meant to be cakes or sweet treats of some sort — painted yellow and red, and his shoes have been painted green, the same as the base stand colour. The fifth figure (Caucasian) is dressed in a station uniform with dark blue cap, trousers, shirt, and red tie. He stands with his right arm outstretched and holds a silver lamp(?) in his hand. His shoes have been painted green, the same as the base stand colour. The sixth figure is female (Caucasian) and she has black hair and is dressed in yellow top and blue dress. She carried a red purse under her left arm and her shoes have been painted blue, the same colour as the base stand. The seventh figure (Caucasian) is dressed in a station/railway uniform with black cap, trousers, and jacket (with gold buttons), and white shirt. He stands with his arms by his sides. His shoes have been painted black. The base stand colour is green. The eighth figure (Caucasian) is dressed in black hat, a grey overcoat, black trousers, and pale tan scarf. He carries a black briefcase under his right arm, has his hands in his overcoat pockets, and his shoes have been painted grey, the same as the base stand colour. The base stands and figures have no manufacturer's mark but carry country of origin detail (Japan) on the underside of the base. The item comes in the distinctive dark blue cardboard packaging associated with this brand of toys and the flat tray has no cellophane wrapped around it. The card carries a white panel on each end and the left hand end has "5859-1" in blue text on it. The front and rear sides have "Metal Miniature H.O. Figures" in large white lettering centred in the middle of the side. The bottom of the tray is also dark blue with "AHI, brand toys" on two lines inside a white rectangle in the centre, and "Made in Japan" to the bottom right (as viewed) in white text.